SKU: BPDKS01. 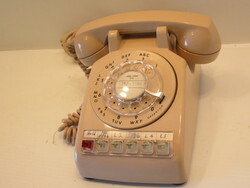 WE 305 5-line dial business phone. 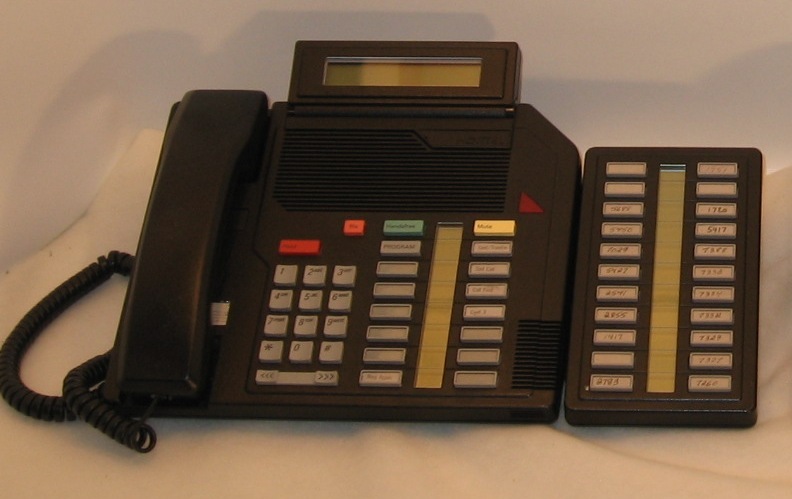 Non-working phones.Black:quantity 5. Circa 1950. SKU: BPDKS02. 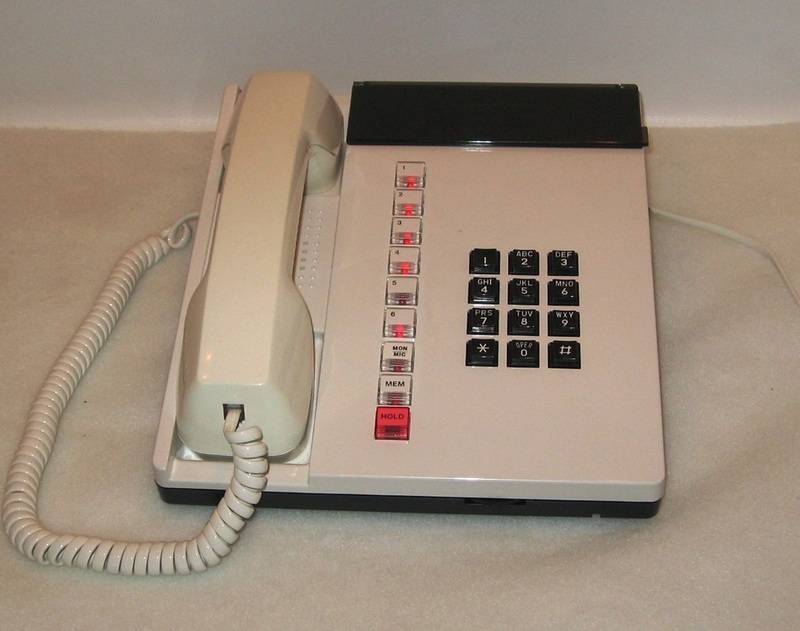 AE Type 86 5-line dial business phone. 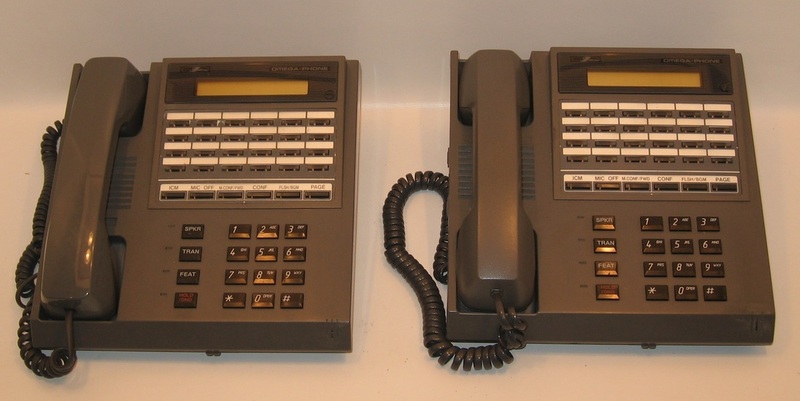 Non-working phones. Black: quantity 5. Circa 1955. SKU: BPDKS03. WE 564 5-line dial business phone. 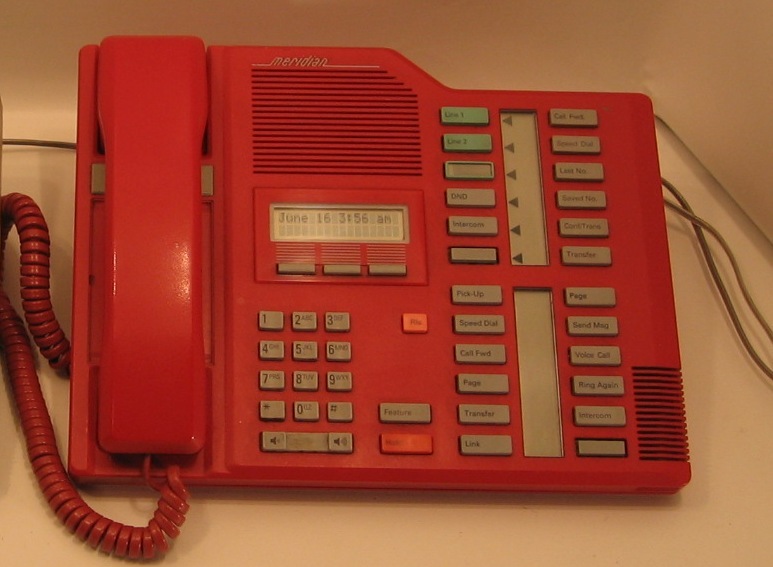 **Additional equipment available to operate line lights for 4 of these phones. Grey: quantity 7. Circa 1955. SKU: BPDKS03. 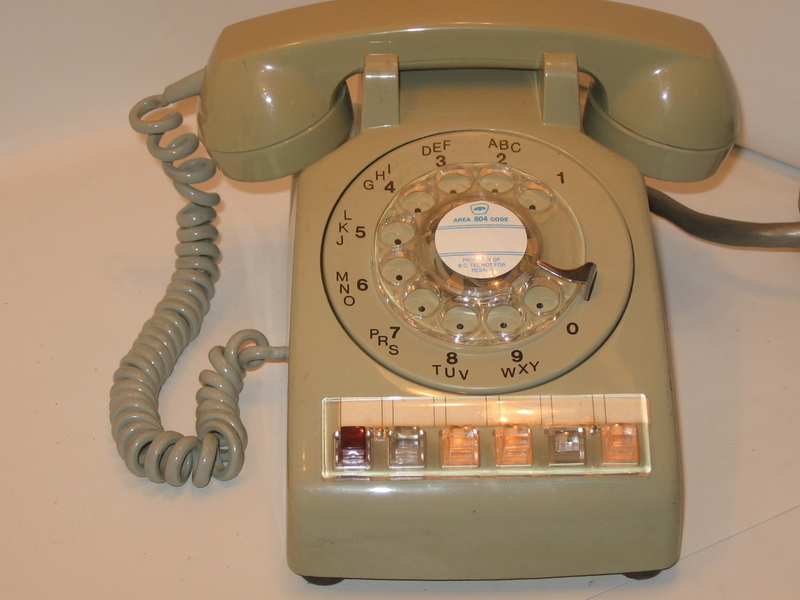 WE 564 5-line dial business phone. **Additional equipment available to operate line lights for several of these phones. Green: quantity 14. Circa 1955. BPDKS03. 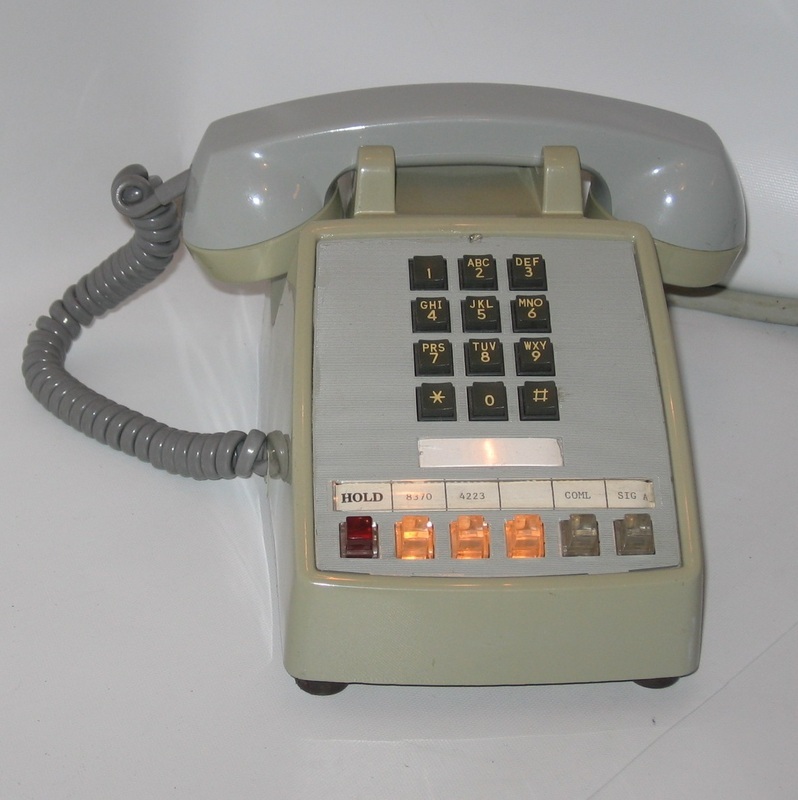 WE 564 5-line dial business phone. **Additional equipment available to operate line lights for 4 of these phones Black: quantity 9. Circa 1955. 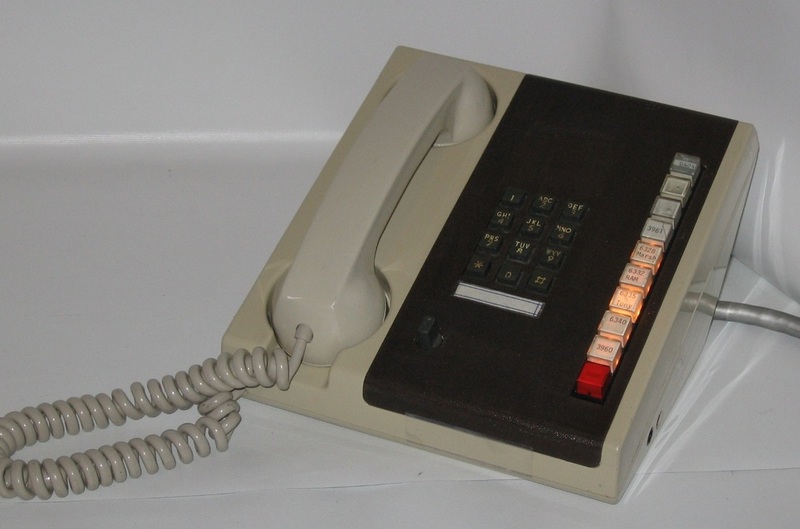 SKU: BPDKS03.WE 564 5-line dial business phone. 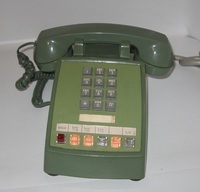 **Additional equipment available to operate line lights on this phone. Beige: quantity 1. Circa 1955. SKU: BPTCKS01. 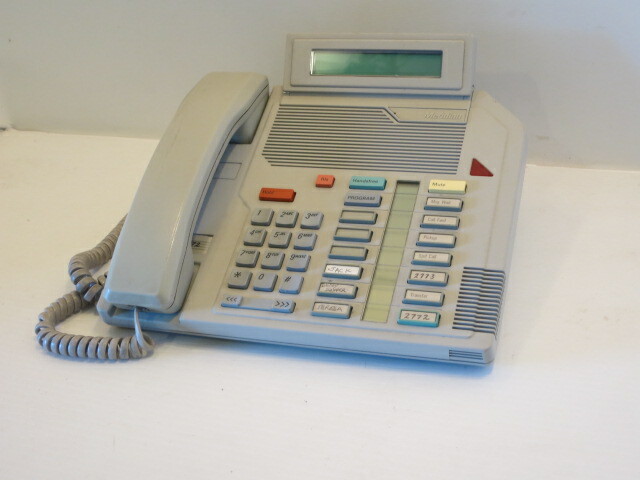 WE 2565 5-line touch call business phone. 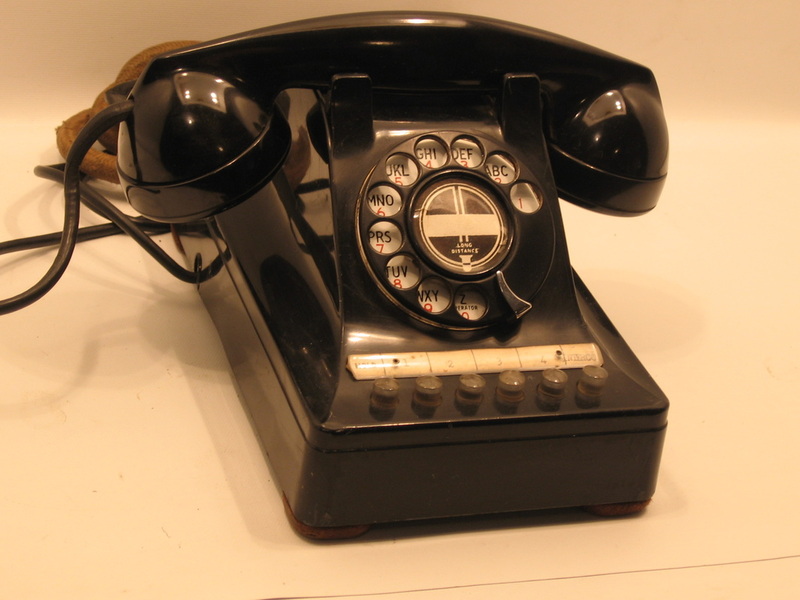 Additional equipment available to operate line lights on these phones. Beige: quantity 5. Circa 1970. SKU: BPTCKS01. 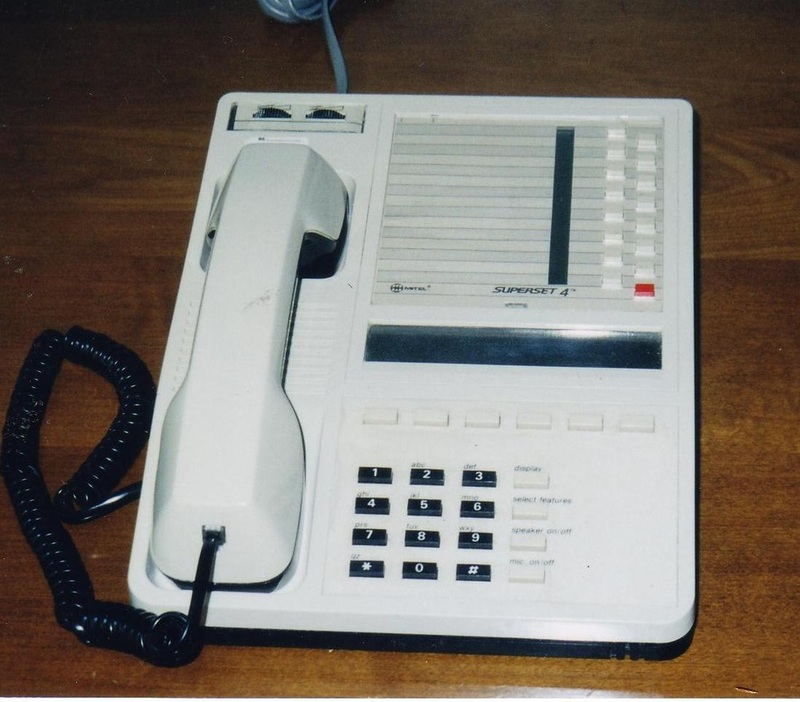 WE 2565 5-line touch call business phone. 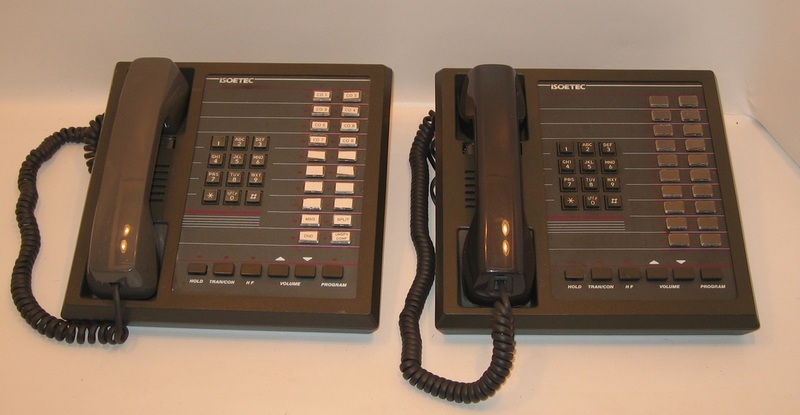 Additional equipment available to operate line lights on these phones. Black: quantity 7. Circa 1970. SKU: BPTCKS01. 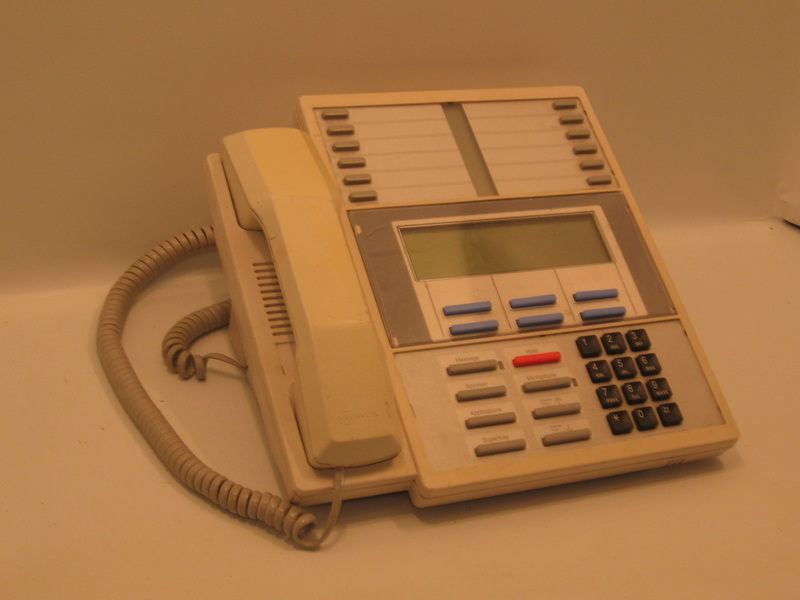 WE 2565 5-line touch call business phone. Additional equipment available to operate line lights on these phones. Green: quantity 3. Circa 1970. SKU: BPTCKS01. 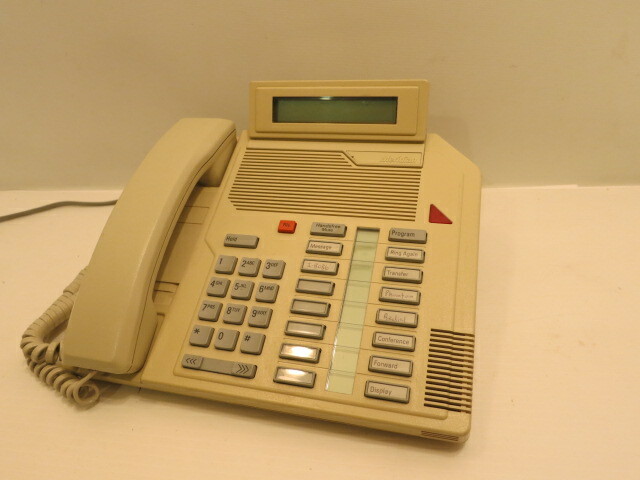 WE 2565 5-line touch call business phone. 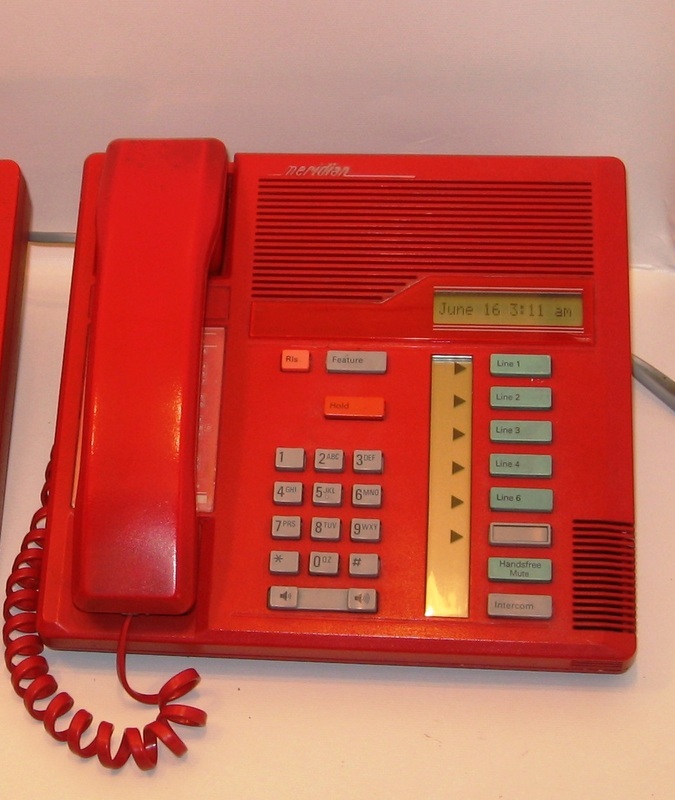 Additional equipment available to operate line lights on these phones. Ivory: quantity 3. Circa 1970. SKU: BPTCKS01. 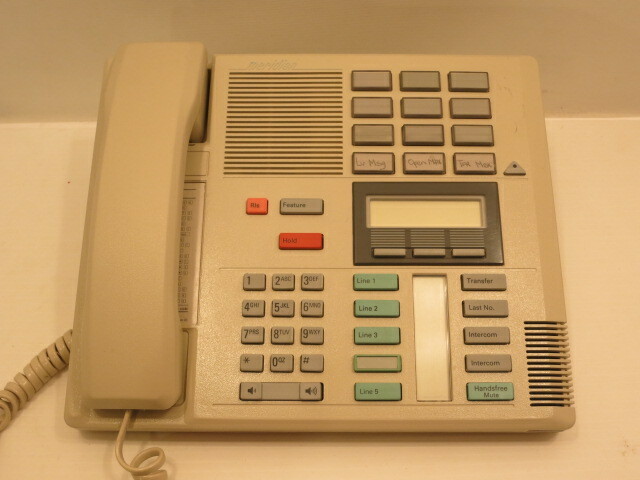 WE 2565 5-line touch call business phone. 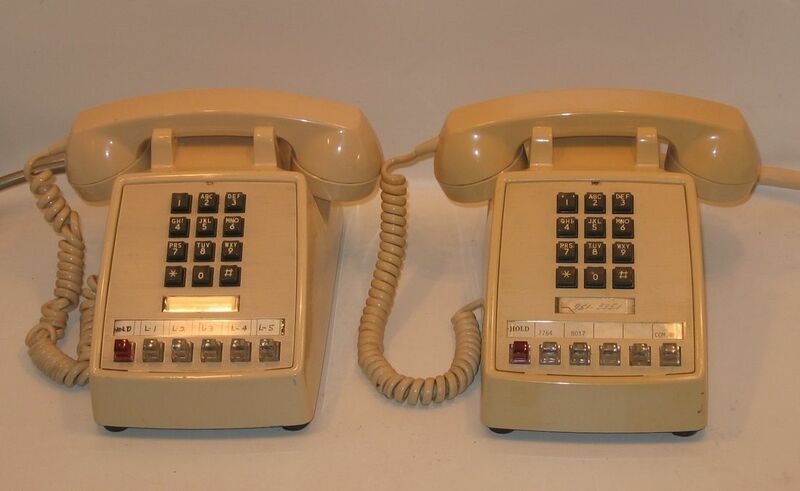 Additional equipment available to operate line lights on these phones. Brown: quantity 2. Circa 1970. SKU: BPTCKS01. 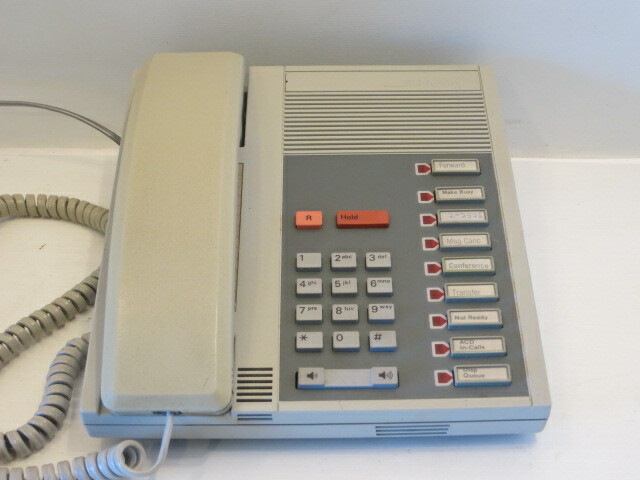 WE 2565 5-line touch call business phone. 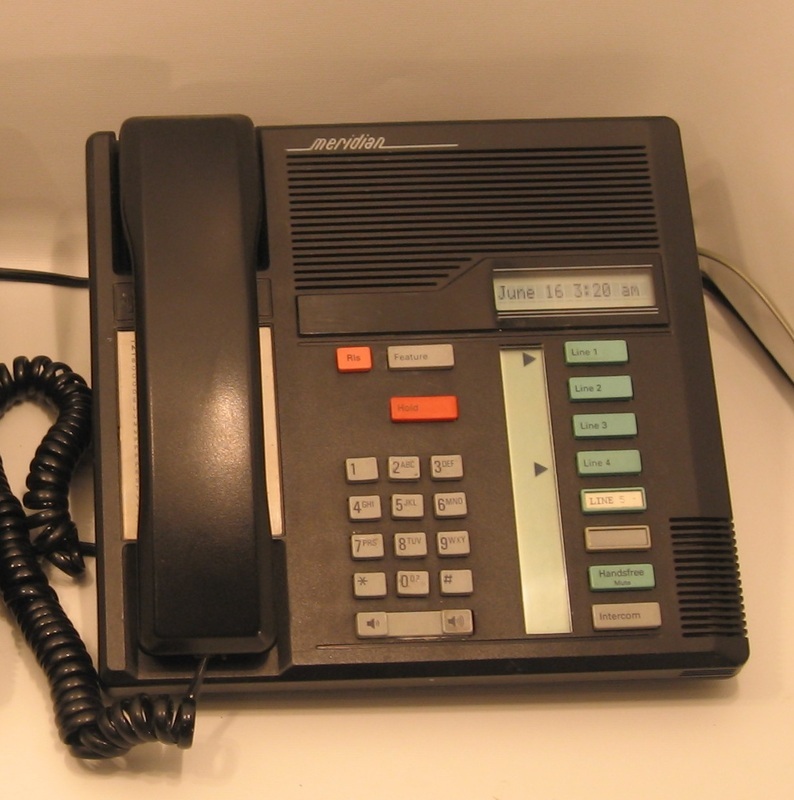 Additional equipment available to operate line lights on these phones. Grey: quantity 2. Circa 1970. 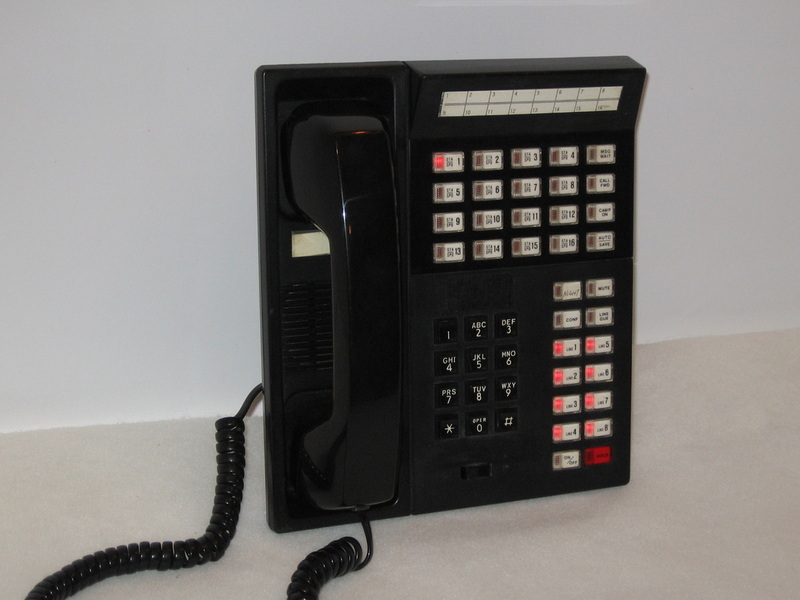 SKU: WE 2565 5-line touch call business phone. 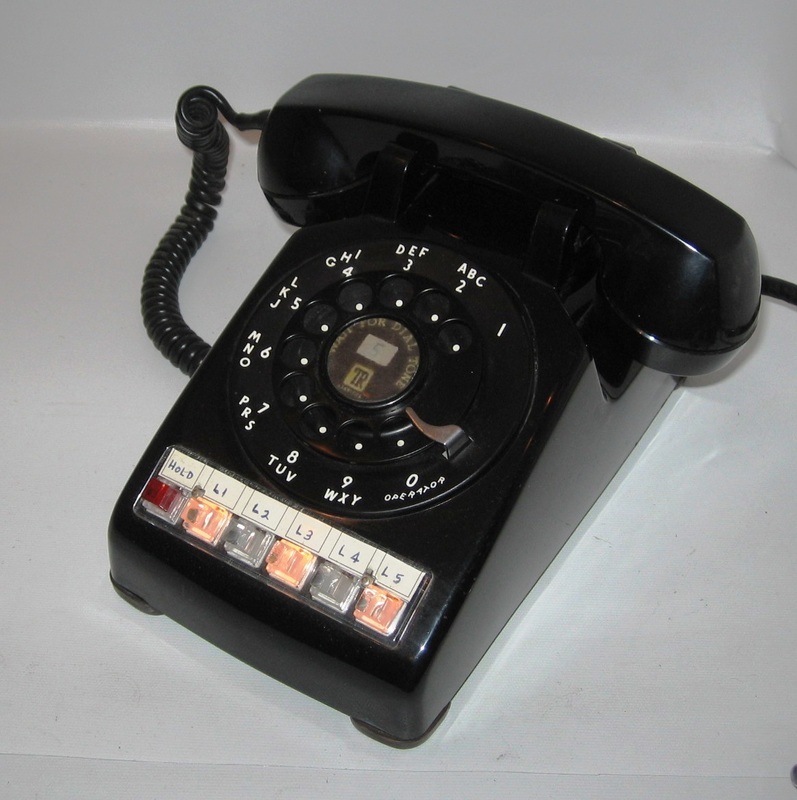 Additional equipment available to operate line lights on these phones. Yellow: quantity 1. Circa 1970. SKU: BPTCKS03. 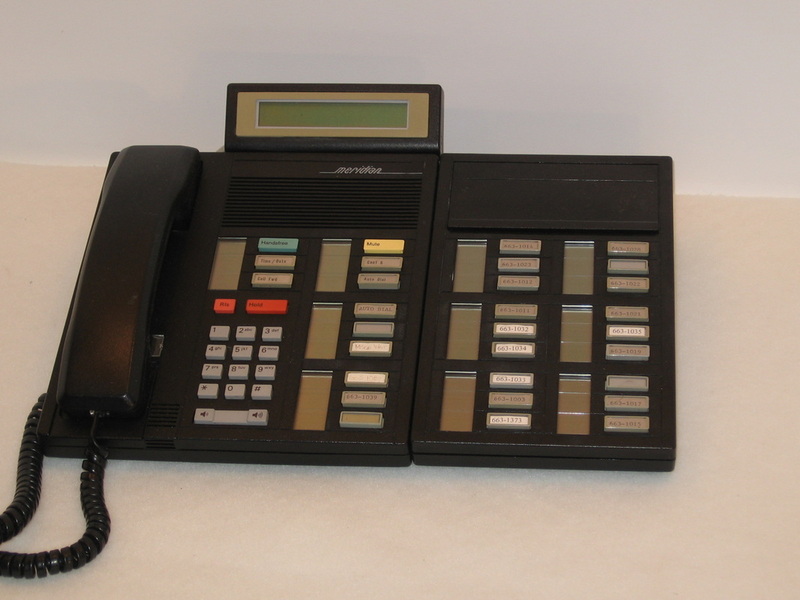 Delphi 6-line touch call business phone. 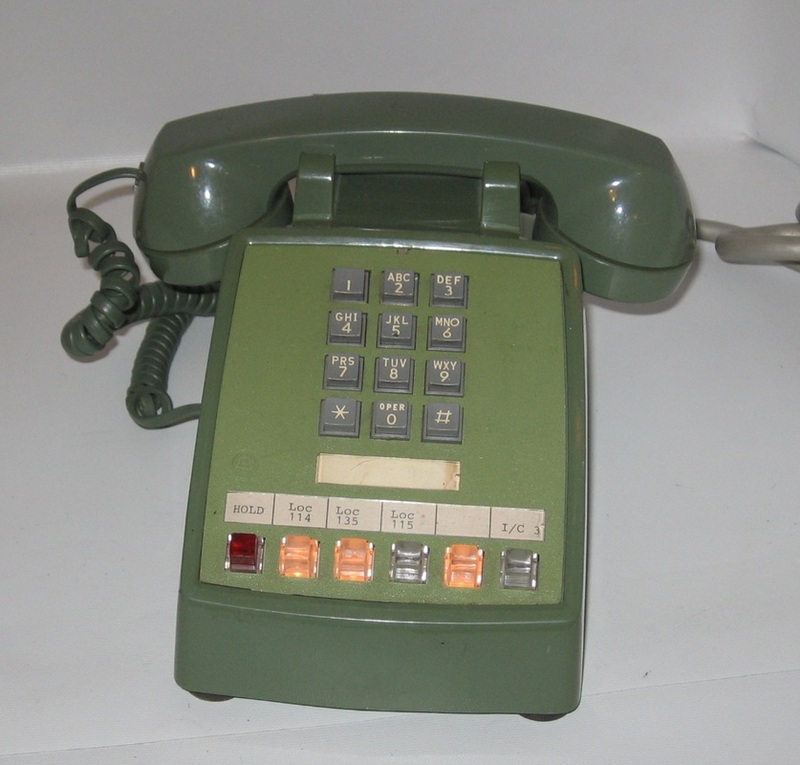 Additional equipment available to operate line lights on these phones. White: quantity 11. Circa 1970. SKU: BPTCKS25. 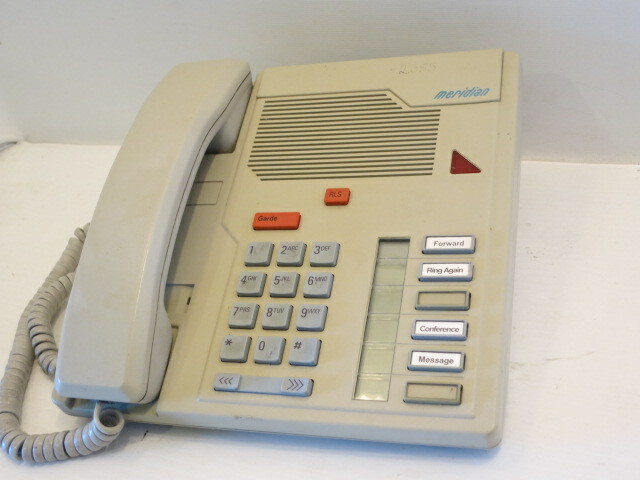 NT double box 20 button touch call business phone. 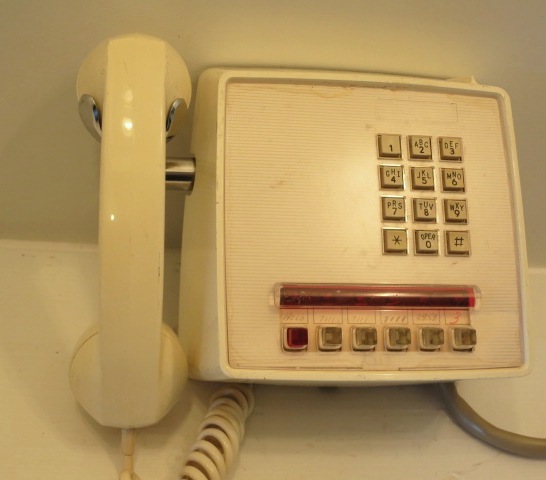 *Digital phone - Not a working system. Ivory: quantity 3. Circa 1980. SKU: BPTCKS24. 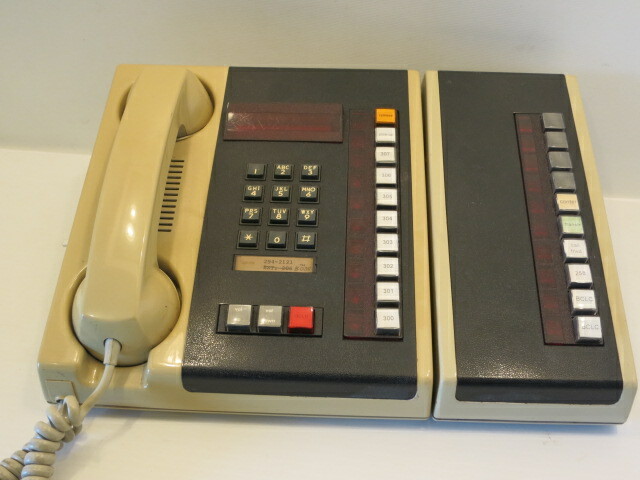 NT Logic 8-line touch call business phone. 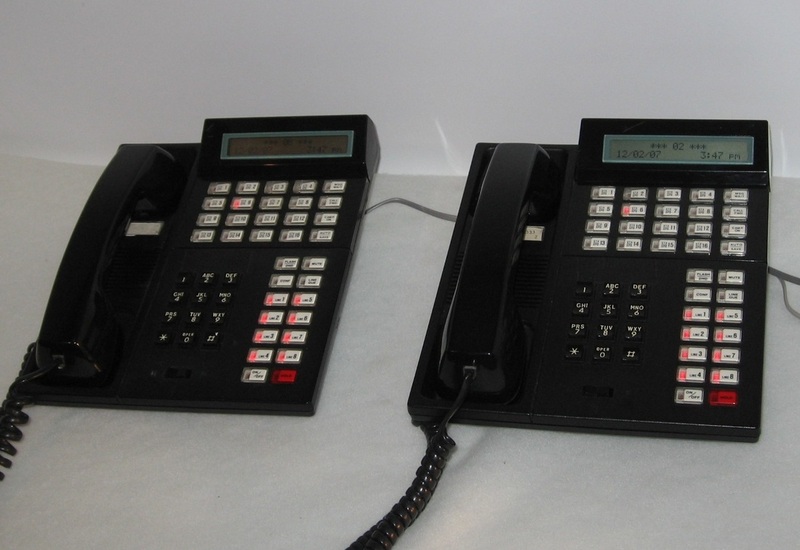 Additional equipment available to operate line lights on these phones. Ivory & brown: quantity 10. Circa 1980. SKU: BPTCKS27. AE 186 5-line touch call business phone. DESK version. 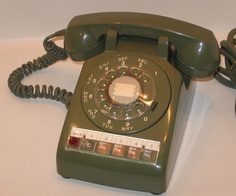 Additional equipment available to operate line lights on these phones. White: quantity 1. Circa 1980. SKU: BPTCKS27. 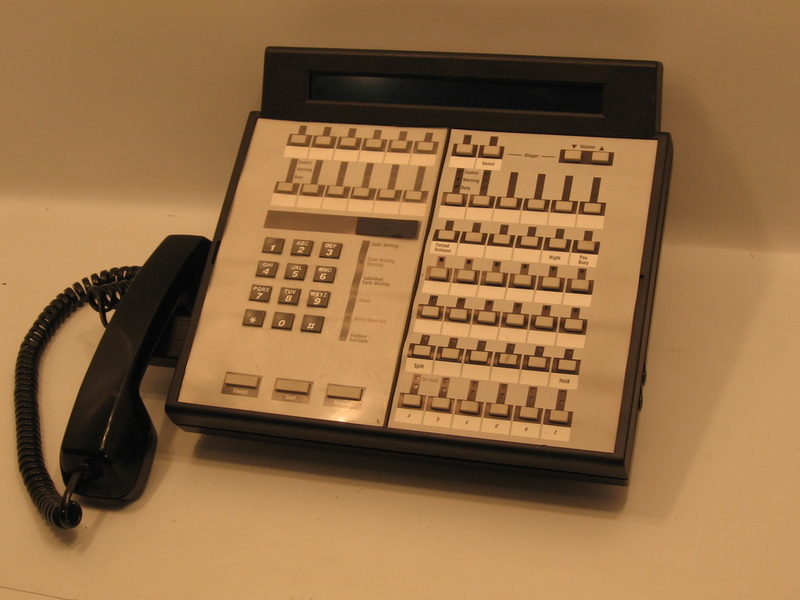 AE 186 5-line touch call business phone. WALL version. 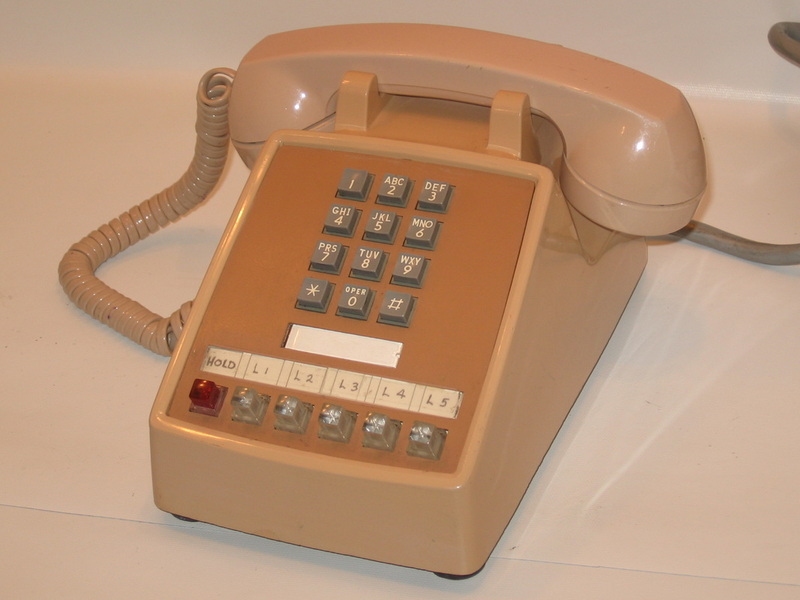 Additional equipment available to operate line lights on these phones. White: quantity 1. Circa 1980. SKU: BPTCKS05. 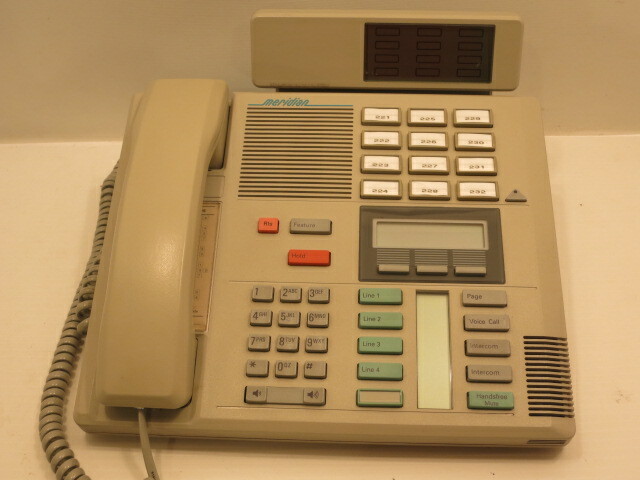 Meridian 7208 6-line touch call business phone. *Working phone. Red: quantity 5. Circa 1985. SKU: BPTCKS05. 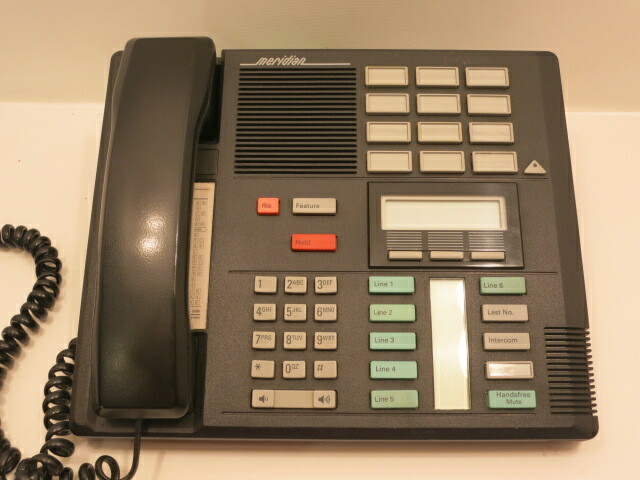 Meridian 7208 6-line touch call business phone. *Working phone. Grey: quantity 6. Circa 1985. SKU: BPTCKS05. 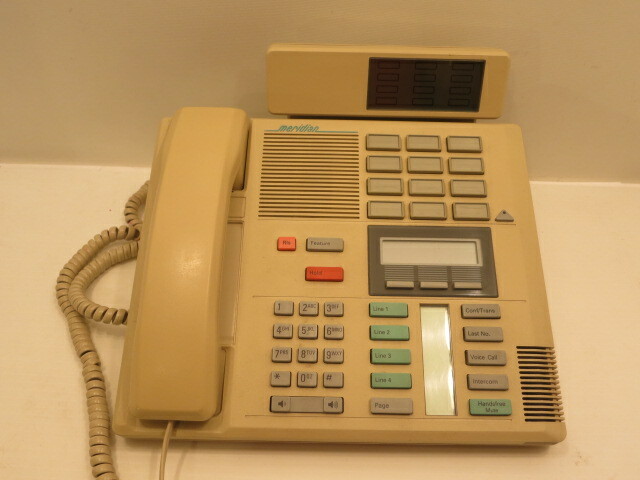 Meridian 7208 6-line touch call business phone. *Working phone. Black: quantity 15. Circa 1985. SKU: BPTCKS06. 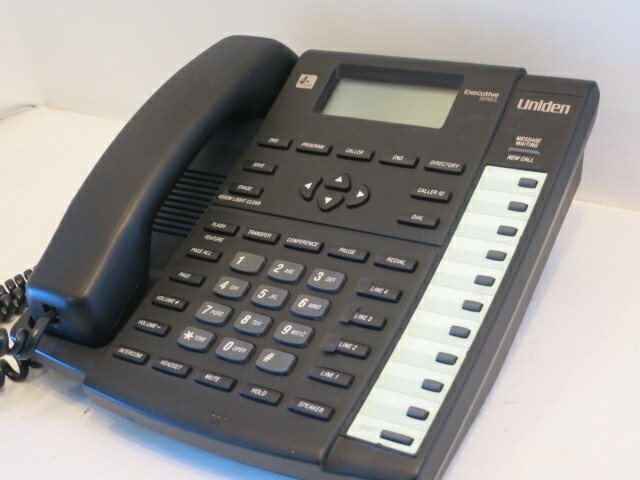 CTG 8-line touch call business phone. WALL version. *Working phone. Black: quantity 42. Circa 1990. SKU: BPTCKS06. 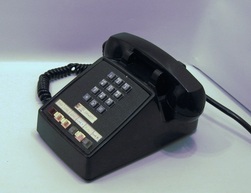 CTG 8-line touch call business phone. DESK version. *Working phone. Black: quantity 42. Circa 1990. SKU: BPTCKS07. 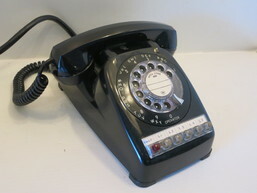 Mitec supersent "4" multiline touch call business phone. Ivory: quantity 6. Circa 1990. SKU: BPTCKS08. 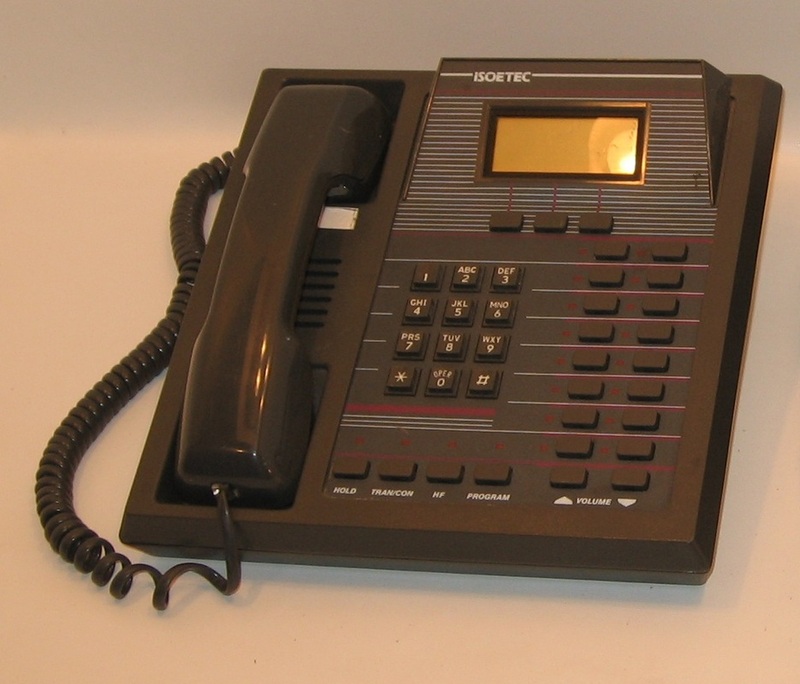 Isotec 8-line touch call business phone. Charcoal: quantity 2. Circa 1990. SKU: BPTCKS08. Ivory: quantity 4. SKU: BPTCKS09. 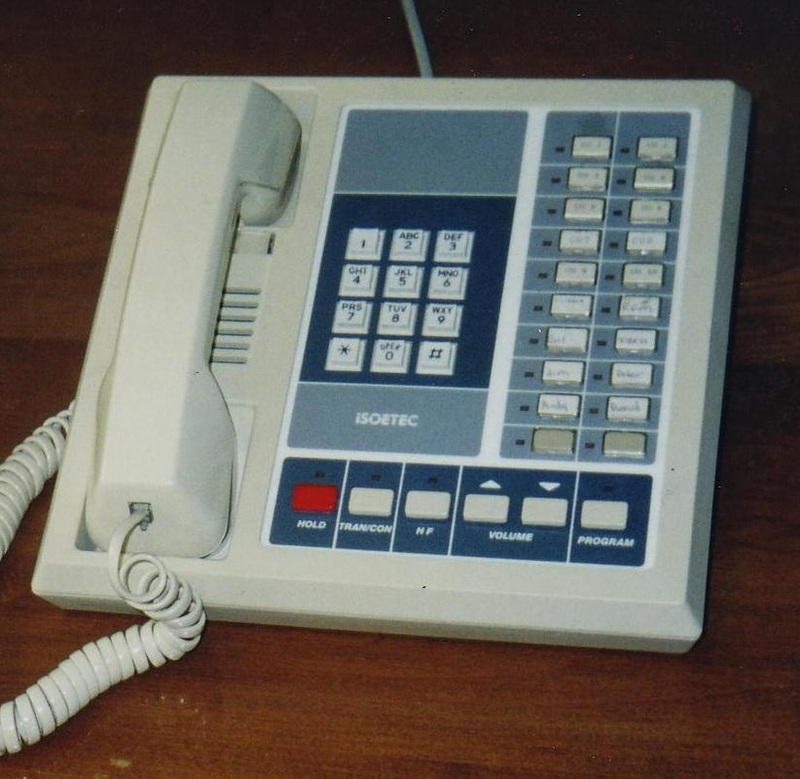 Isotec 20-line touch call business phone. Charcoal: quantity 2. Circa 1990. SKU: BPTCKS09. Ivory: quantity 7. Circa 1990. SKU: BPTCKS10. 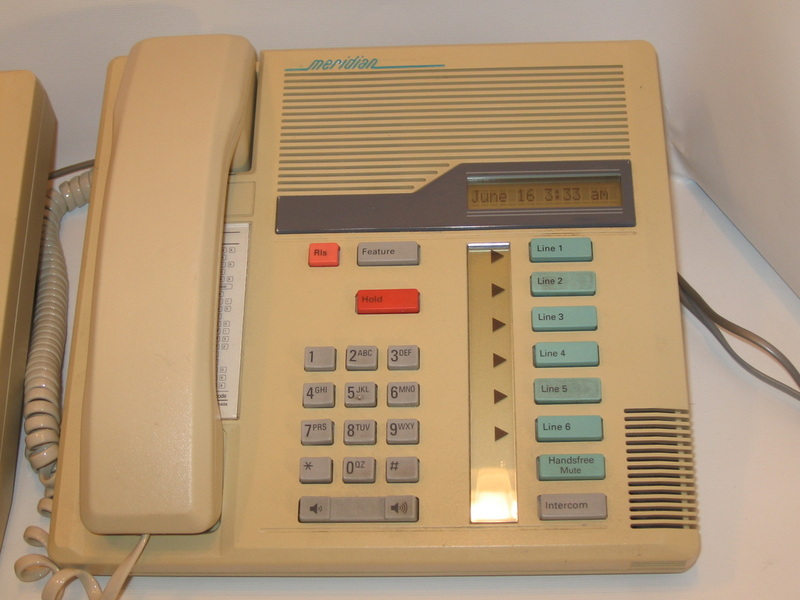 Meridian 6-line touch call business phone. Grey:quantity 4. Circa: 1990. SKU: BPTCKS11. 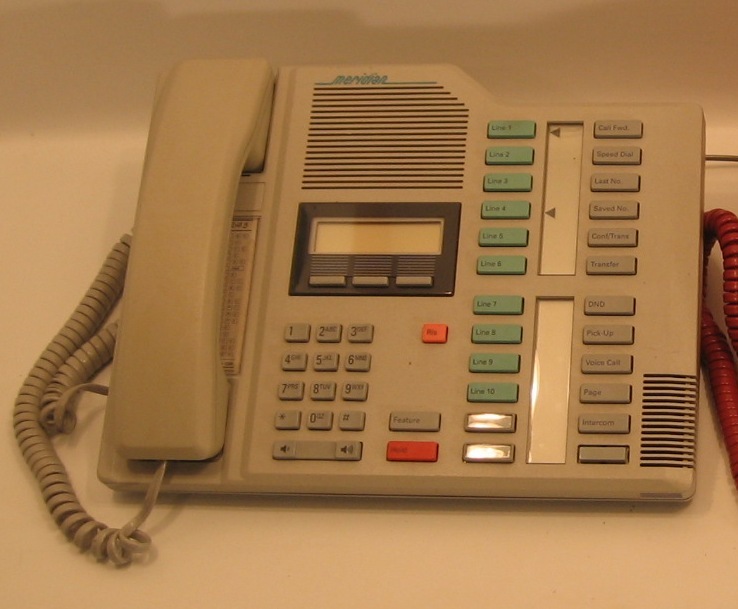 Meridian 6-line touch call business phone with screen. Grey: quantity 3. Circa 1990. SKU: BPTCKS12. 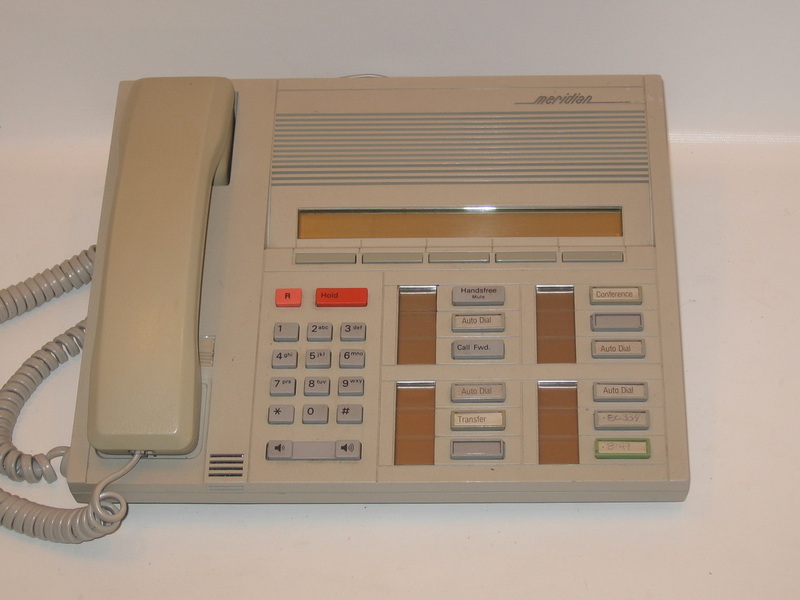 Meridian 2317 5-line digital touch call business phone. Grey: quantity 1. Circa 1990. SKU: BPTCKS14. 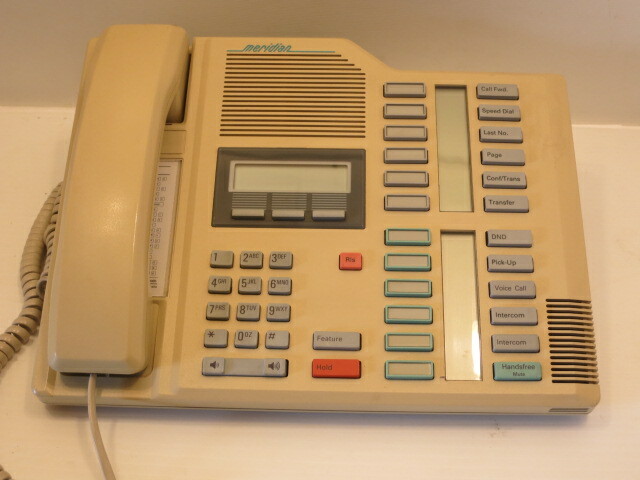 NT 7310 8-line touch call business phone. *Working phone. Black: quantity 25. Circa 1990. SKU: BPTCKS14. *Working phone. Ivory: quantity 25. SKU: BPTCKS14. *Working phone. Grey: quantity 3. SKU:BPTCKS14. NT 7310 with add on for additional lines. *Working phone. Grey: quantity 7. SKU:BPTCKS14. 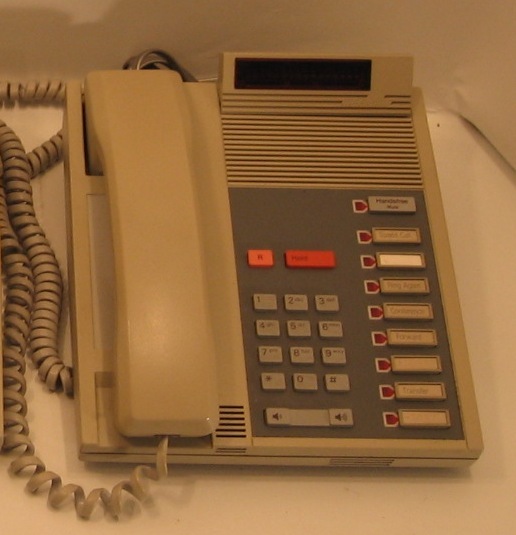 NT 7310 with add on for additional lines. *Working phone. Ivory: quantity 3. SKU: BPTCKS15. 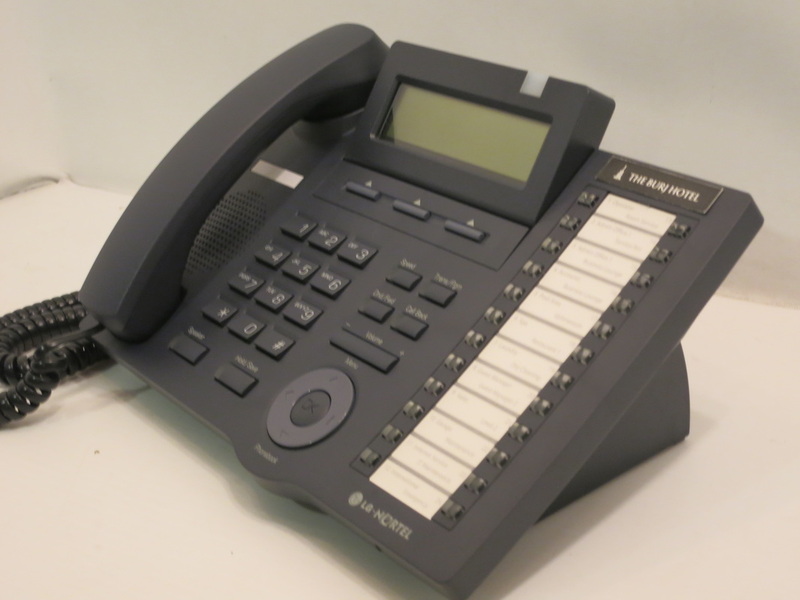 Meridian 5316 - 6-line digital touch call business phone. Black: quantity 34. Circa 1990. SKU: BPTCKS15. Ivory: quantity 4. SKU: BPTCKS15. Grey: quantity 16. SKU: BPTCKS16. 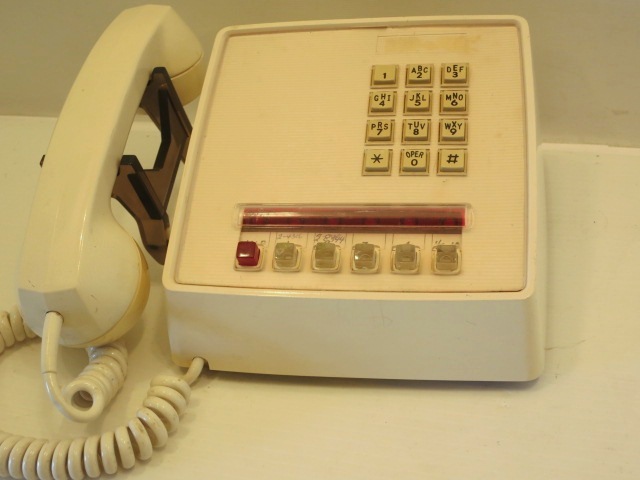 Omega 24 button display touch call business phone. Charcoal: quantity 1. Circa 1990. SKU: BPTCKS17. 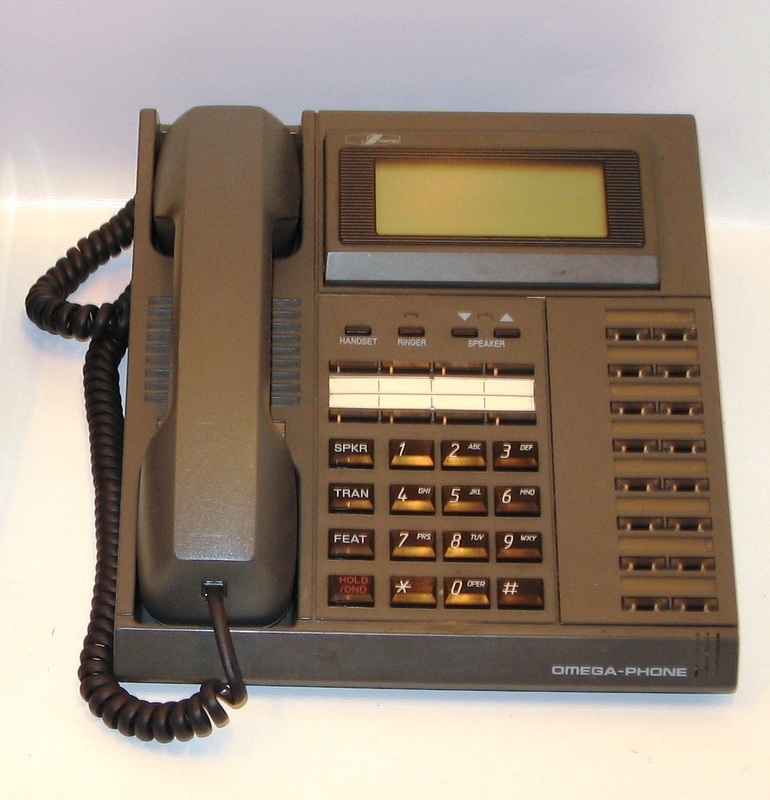 Omega 24-button executive touch call business phone. Charcoal: quantity 3. Circa 1990. SKU:BPTCKS20. 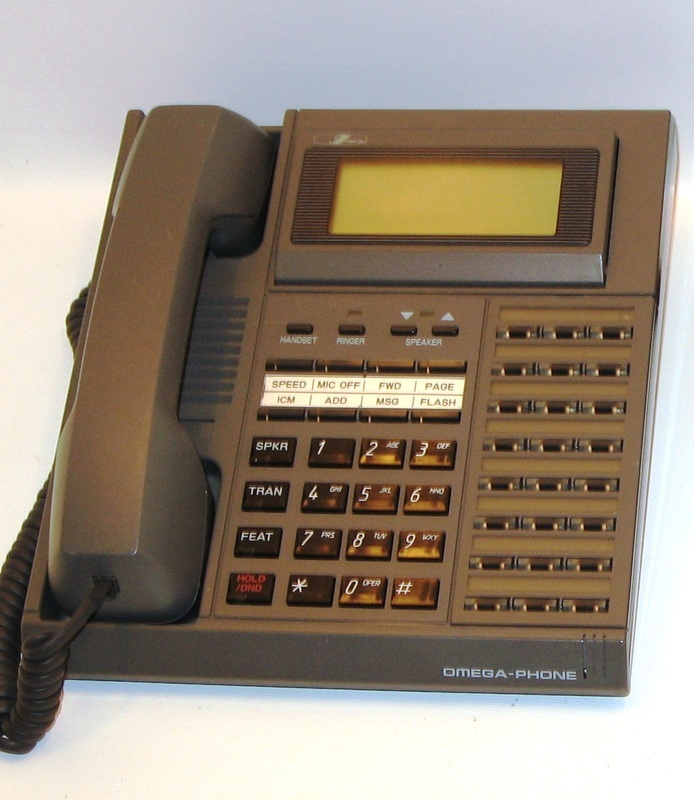 Omega 1 x 16 KTC 16 button touch call business phone. Charcoal: quantity 1. Circa 1990. SKU: BPTCKS21. 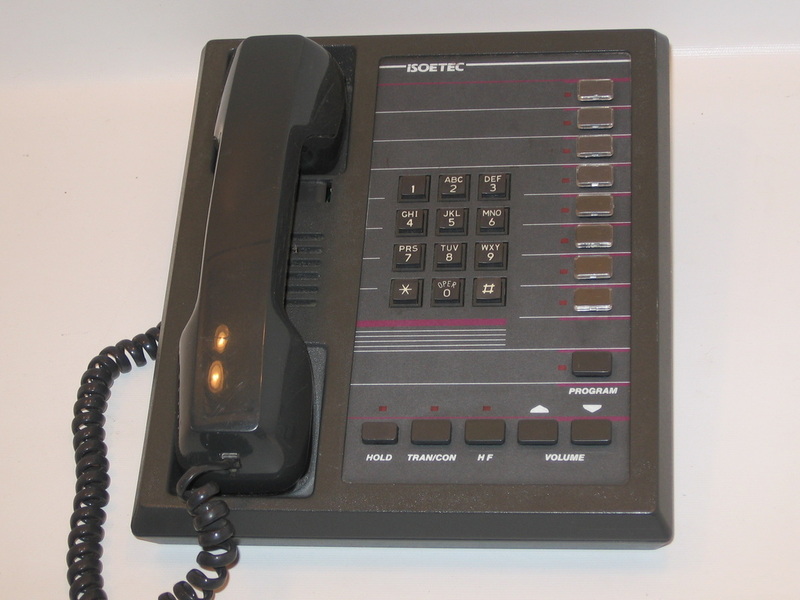 Isotec 18 button touch call business phone. Charcoal: quantity 1. Circa 1990. SKU: BPTCKS22. 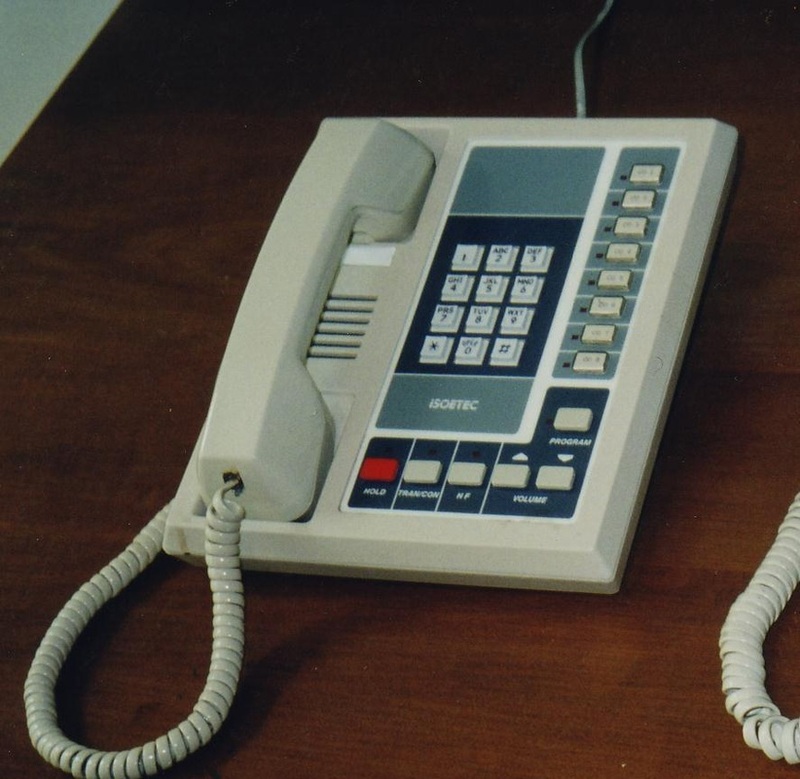 Meridian 3000 with note pad. Black: quantity 2. Circa 1990. SKU: BPTCKS23. 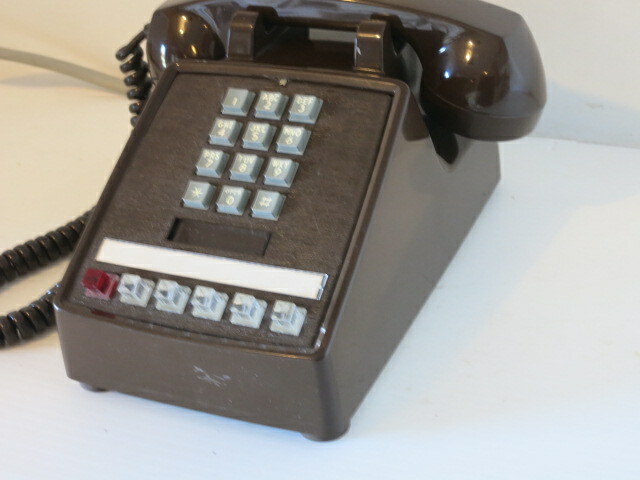 Executone 6-line touch call business phone. Grey: quantity 1. Circa 1990. SKU: BPTCKS23. Grey: quantity 1. SKU: BPTCKS35. 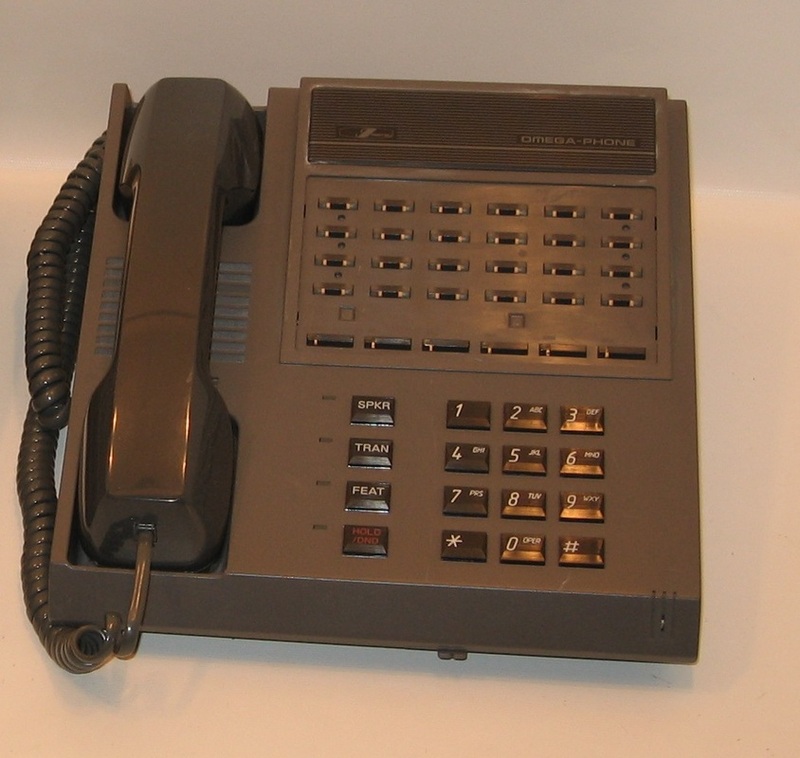 Meridian 7324 12-line touch call business phone. *Working phone. Grey: quantity 10. Circa 1990. SKU: BPTCKS35. *Working phone. Red: quantity 10. SKU: BPTCKS35. 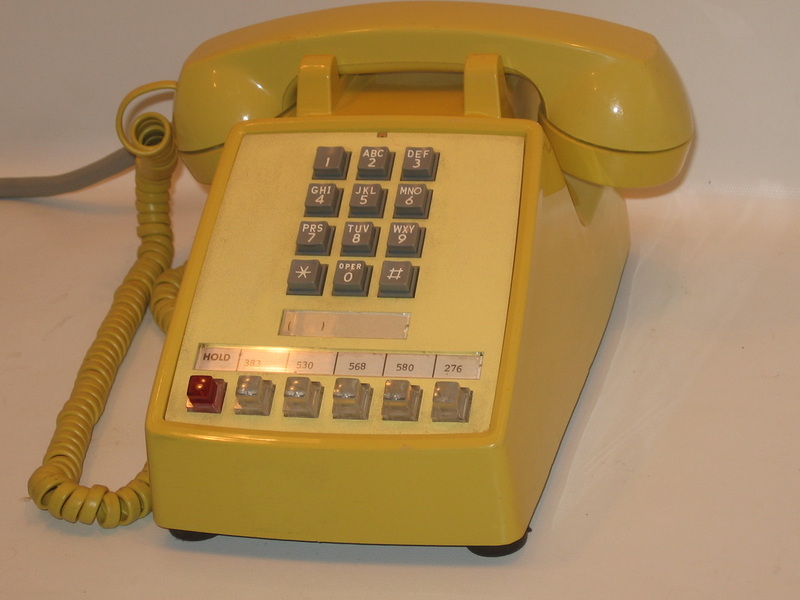 *Working phone. Ivory: quantity 4. SKU: BPTCKS33. 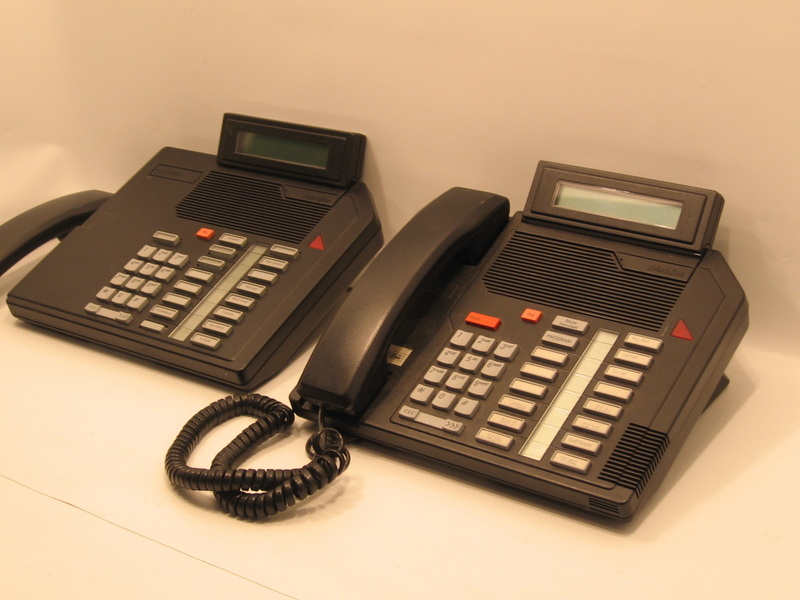 Meridian multiline touch call business phone with add-on for additional lines. Black: quantity 5. Circa 1992. SKU: BPTCKS34. 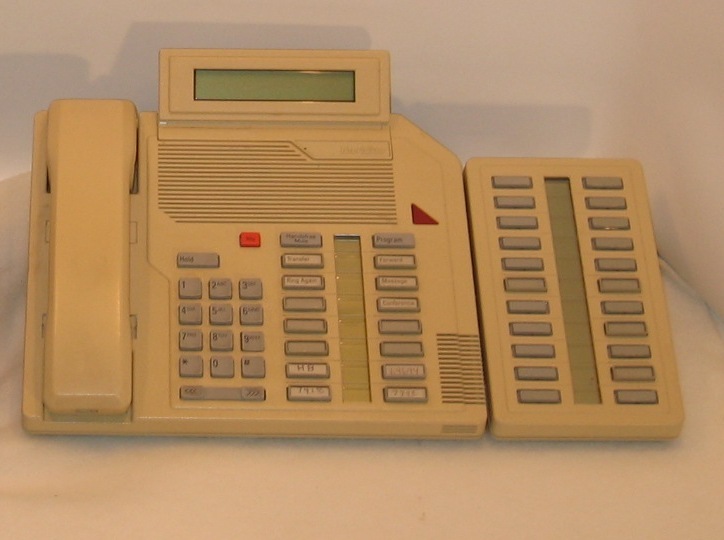 Meridian 2006 6-line touch call business phone. Grey: quantity 2. Circa 1993. SKU: BPTCKS36. Meridian 5316 with add-on for additional lines. Ivory: quantity 1. Circa 1995. SKU: BPTCKS36. Meridian 5316 with add-on for additional lines. Black: quantity 2. Circa 1995. SKU: BPTCKS37. Lucent - 302A touch call business phone with attendant counsel. Black: quantity 1. Circa 1995. SKU: BPTCKS38. 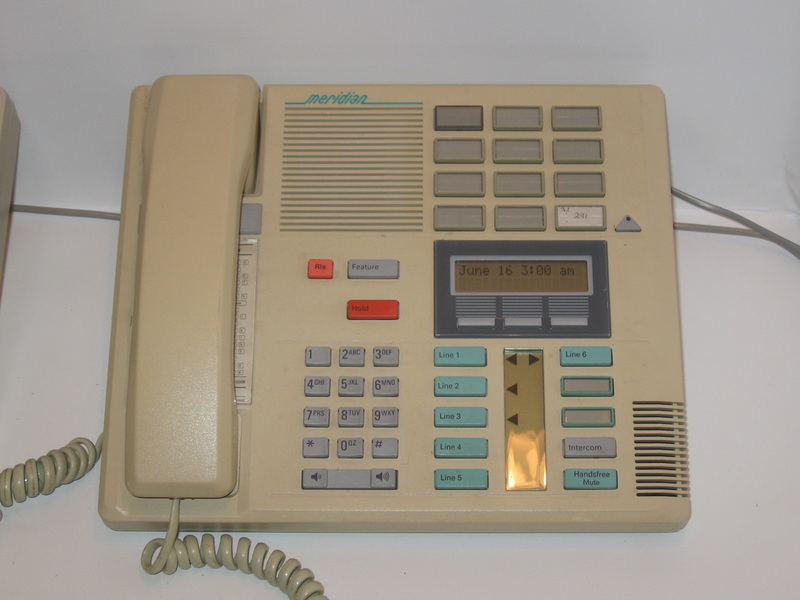 Mitel superset 6-line touch call business phone. Ivory: quantity 1. Circa 1995. SKU: BPTCKS39. 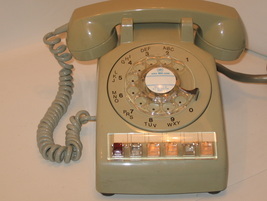 Tone commander 4-line touch call business phone. Black: quantity 1. Circa 1995. SKU: BPTCKS18. 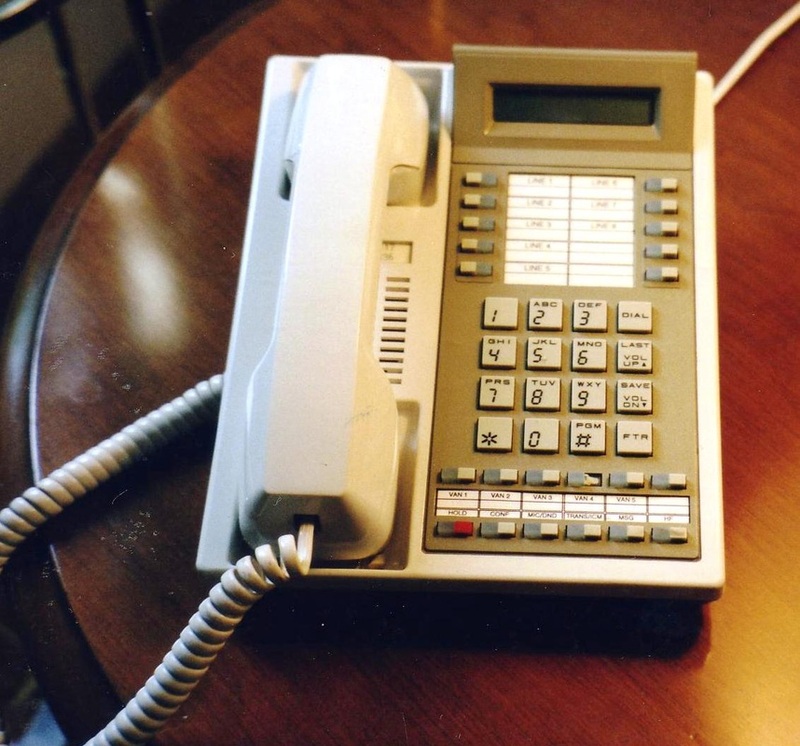 Meridian 2000 6-line touch call business phone. *Working phone. Black:quantity 3. Circa 1999. SKU: BPTCKS30. Delphi 5-line touch call business phone. Ivory: quantity 18. Circa 2000. SKU: BPTCKS40. 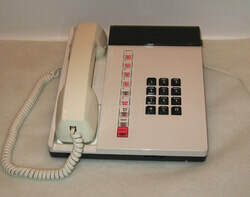 420C Uniden 10-line touch call business phone. Black: quantity 4. Circa 2010. SKU: BPTCKS41. 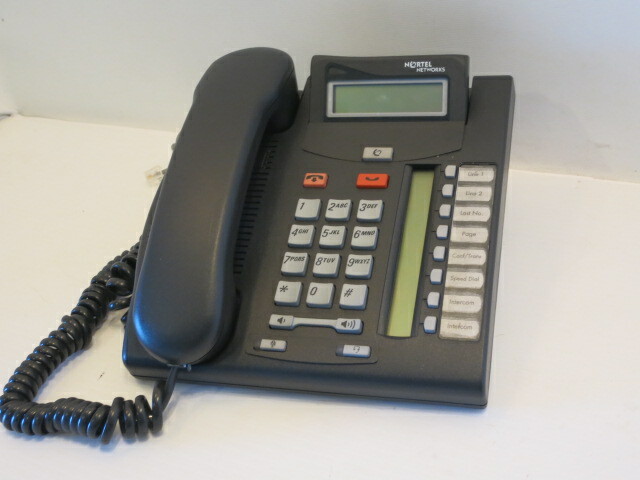 Nortel Aria multiline touch call business phone. Black: quantity 4. Circa 2012. Dubais.